I've been a bit slow sorting out my New Year goals this year. I don't really have an excuse, except that I've been busy catching up on various genealogy bits and pieces, which I'd put to one side during November and December, while I worked on a non-genealogy work project (good for the bank balance!). I also checked back to my Top 10 Genealogy Resolutions for 2011, and although not all of them have been achieved, I was pleased to see how many of them I did indeed achieve. The biggest one, for me, was definitely obtaining my PG Diploma in Genealogical Studies at the University of Strathclyde. Although it was a huge amount of work, I found it a most satisfying experience. The PG Dip took up much of my energy in 2011 until August, but it is now serving me well in my genealogy client work. Interestingly, I note that this time last year, I did not even mention "developing client work" as one of my resolutions, and I indeed I have not directly sought out these clients. But "word of mouth" is a wonderful thing, and since completing my PG Dip, I've been lucky enough to have a continual source of client work on the go. This has lead me to rethink my goals for 2012, as I am really enjoying the research I am doing for others, either building their family trees from scratch, or helping them to break down their brick walls, especially in and around London. Join at least one professional genealogy association such as APG and / or AGRA (since I started writing this list I've actually now joined APG so I've already achieved this one). Blog more regularly. I have a long list of possible topics to write about, but don't seem to get around to completing them. I am very aware that my latest blog post dates back to last September, which I am rather ashamed about. My only excuse is my late summer holiday combined with taking on that non-genealogy work. Get more involved with my local family history society (WSFHS) and my local archives (Surrey History Centre). Sometimes genealogy work can be a lonely business and getting out of the house and sharing experiences with others, is good for the soul. Make more regular visits to the London archives. The archives which I am aiming to visit more regularly include London Metropolitan Archives, Society of Genealogists, Lambeth Archives, Southwark Archives, Westminster Archives, and of course The National Archives in Kew. Write up my own and my husband's family histories - obviously the feasibility of achieving this will depend upon having some spare time to do this! But as I write up my own family history I am sure I will learn more aspects that will help me with future client work. Explore the possibility of writing a family history related book. I already have an idea for a book, about a particularly interesting character in my family, but I need to progress this by writing a plan, gaining approval from the rest of the family and exploring publication options. Develop a London Roots Research website. This was one of the goals from 2011 that I didn't achieve last year, but that I would very much like tackle this year. Continue to develop my client work in and around London, building family trees, finding new ways of presenting them, and helping others to break down their brick walls in and around London. I find I learn so much from each new client that I take on, and gain tremendous satisfaction from helping them. Well that should keep me busy! I doubt I will achieve all of them but I do find it useful to set them out as a start to the year ahead. I wish all of my readers a very happy and healthy New Year and hope you enjoy sharing my progress along the way in 2012. With all of those goals it looks like a very busy year ahead. Best of luck! Go for it Rosemary! And well done on your Diploma :) Have a great 2012! Thanks Sharon, Debra and Ros. I realise it is an ambitious list, but I decided that goals are just that, and not obligations. I hope that some of these goals will be achieved but won't be beating myself up if they aren't. In the meantime, they help give me a focus! Thanks Audrey. 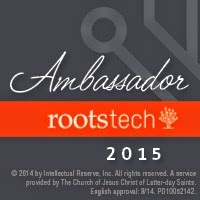 Next year I'm even thinking of adding "attend Rootstech" as everyone who went seems to have had such a great time! That's a great list. Quite inspirational! Thank you, berkshireresearch. Your comment is much appreciated, and apologies for the delay in responding! I have not been able to keep the blogging up recently, but hope to start again soon.